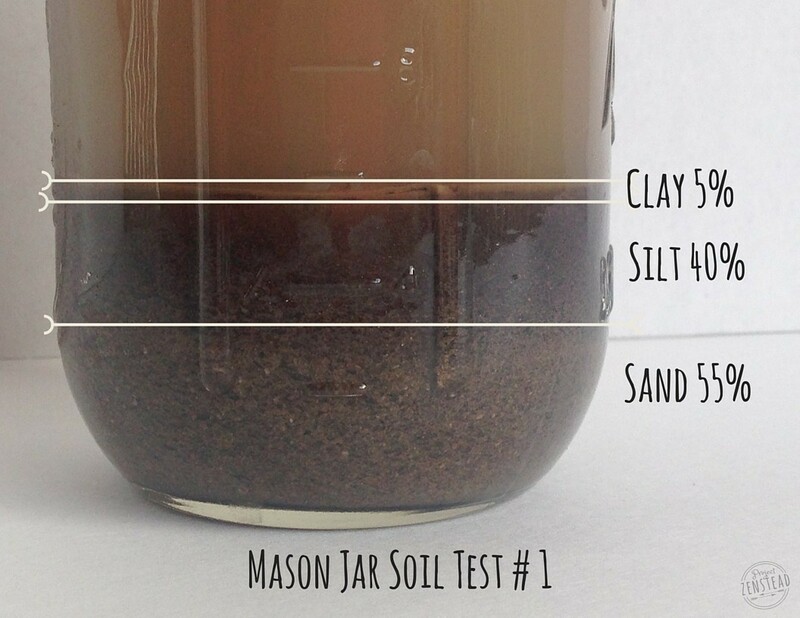 Test the texture of your garden soil using these easy at-home DIY soil texture test! 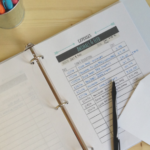 No fancy supplies are needed, and you’ll have your results within a few hours! If you want a beautiful garden that will grow you lots of food, you’ve got to start with good soil. 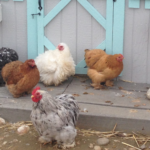 No amount of fertilizer or chemicals can improve your soil texture or quality. It has to be done naturally… that’s why we call it “nature”. So just put down the miracle grow and back away! But you probably already know all of that since you are here reading this. 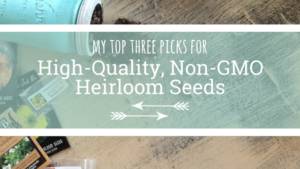 So I won’t waste a lot of time preaching about how important it is to have high quality soil (I’ll save that soapbox speech for someone else). 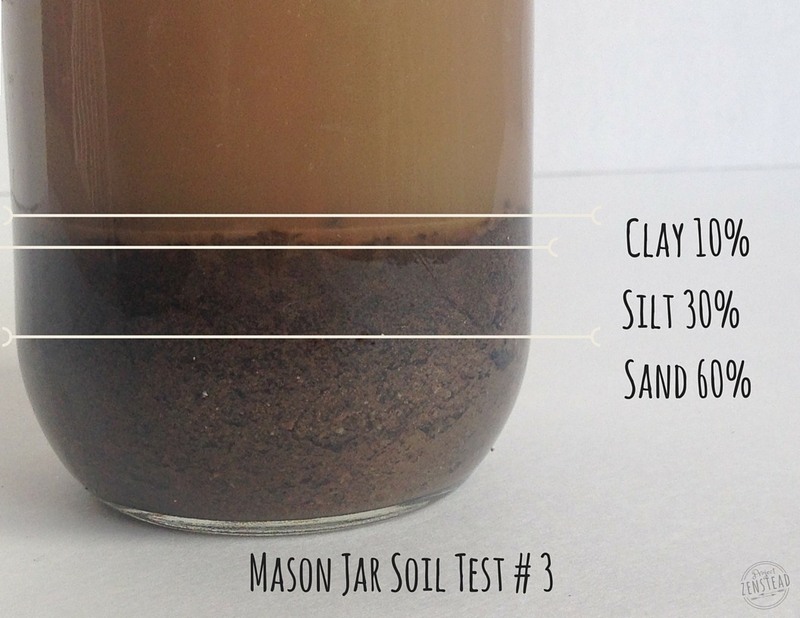 Instead, let’s jump right into why and how you can easily test your soil texture at home using a mason jar! Testing soil texture helps us better understand how to take care of our plants. The texture greatly effect your soil drainage which can make or break your success with certain plants. Soil is made up of different particles that have broken down from larger rocks and minerals over time. These particles are grouped into three classifications based on their size: sand, silt and clay. Sand is the largest particle of the three. Sandy soil feels coarse to the touch and you can see the individual particles with the naked eye. Because of its size, it doesn’t compact down on itself like smaller particles do. The space between the particles allows for oxygen and drainage (remember, your plant roots need oxygen just like the leaves do!). If there is too much sand in your soil, it can lead to poor water retention and soil erosion. Sand also has poor mineral retention. Silt is a medium sized particle, smaller than sand but larger than clay. Silt usually feels smooth to the touch, but not sticky. Soil high in silt is generally high in nutrients and this soil type is commonly found around fertile river beds. The medium-sized particles compact more than sand and therefore it holds and conduct water better than sand. However, if silty soil becomes overly compacted, it will result in poor air circulation and water-logging. Clay is the smallest particle classification. Clay feels sticky to the touch. The super small particles that compose clay bind together and compact easily. Because of this, clay soil has very high levels of water retention. 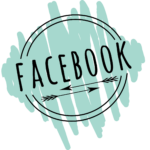 It also retains and conducts minerals and nutrients well. On the flip side, it easily becomes overly compacted, leading to poor drainage and poor root penetration. It is also the slowest soil type to warm in the spring because of poor air flow. Clearly, each of the three types of soil has pros and cons, which is why it becomes important to have a nice mix of the three. 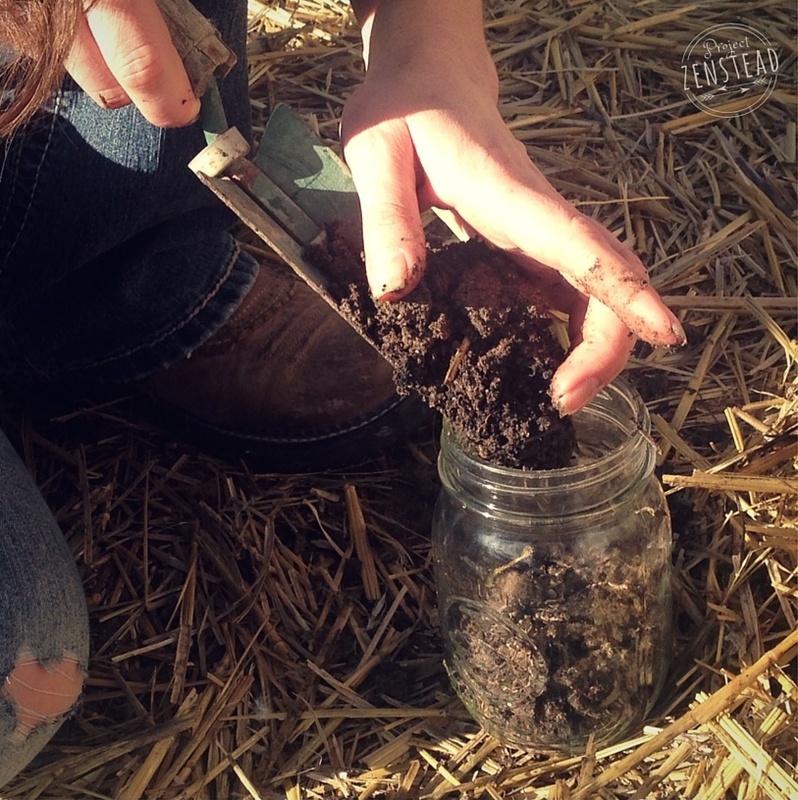 The ideal soil texture ratio is called “loam”. 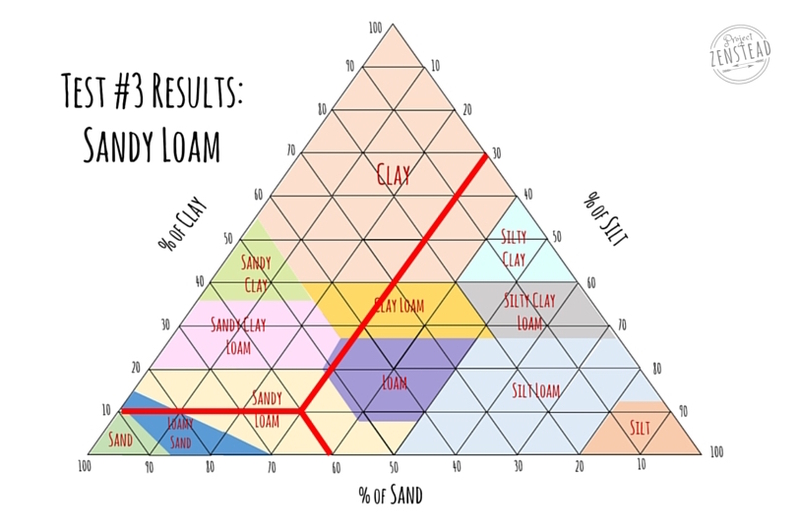 Loam is comprised of 40% sand, 40% silt and 20% clay. Loamy soil contains the ideal amount of sand, silt and clay to properly maintain moisture and conduct nutrients to those beautiful plants of yours. 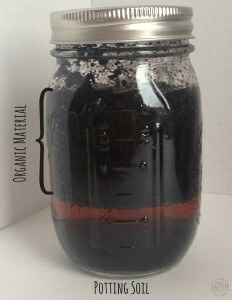 1.Fill jar about half way with soil. Be sure to dig down about 1-2 inches to collect your sample. 2. Fill the jar with water. 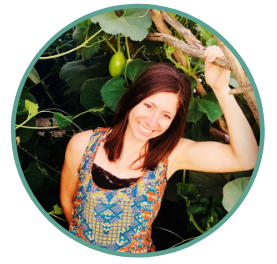 You will want equal parts water and soil. 3. Place lid securely on jar and shake well for a couple of minutes until soil is thoroughly combined and suspended. 4. 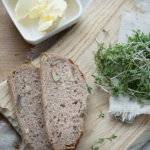 Place jar on a flat surface and leave untouched for at least 24 hours. Yo! You might also like this post! 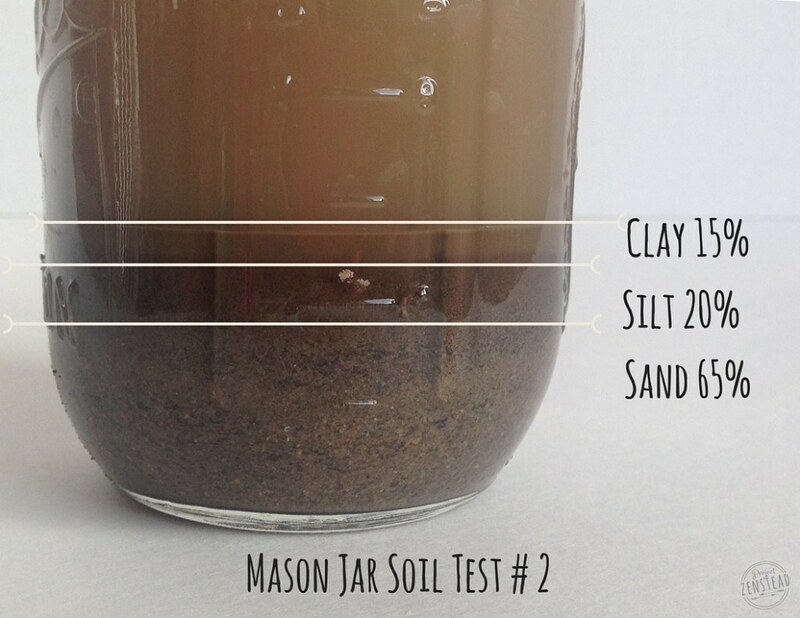 There are a couple ways you can gather results from your soil texture test. You can use a ruler to measure each layer as they settle out, or you can just eyeball the whole thing after the jar has had at least 24 hours to settle. Here’s what you are looking for: As your jar sits, the particles will start filtering out of the suspension. Sand is the largest and heaviest particle, so it will settle out first and begin collecting on the bottom of the jar within minutes. 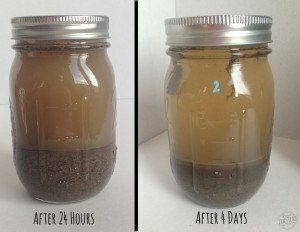 After about 15-20 minutes, take a look at your jar. You can use a ruler to measure the amount of sand that has settled. Silt will settle out within the next several hours. If you are using a ruler to measure, be sure to give the silt several hours to settle before taking a measurement. Clay particles will take the longest to settle out and will form a layer on top of the silt. They can stay suspended in the water for days, so it is important to wait at least 24 hours or more before measuring. Organic material in your soil will float to the top of the water. You can see in the picture below the difference between a 24 hour wait period and a four-day wait period. The water is much clearer after 4 days and the layers are more distinct as well. 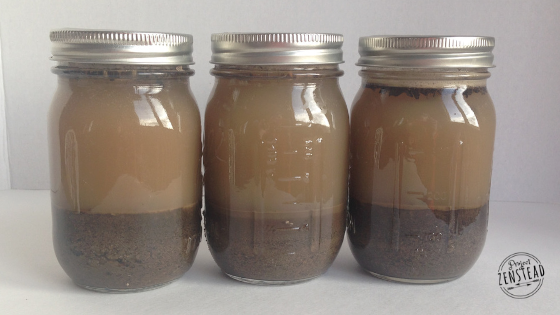 Once your soil has separated into layers, you will need to calculate the percentage of each soil type. Don’t worry too much about being exact – you just need to be close enough to get a good understanding of your soil’s texture. 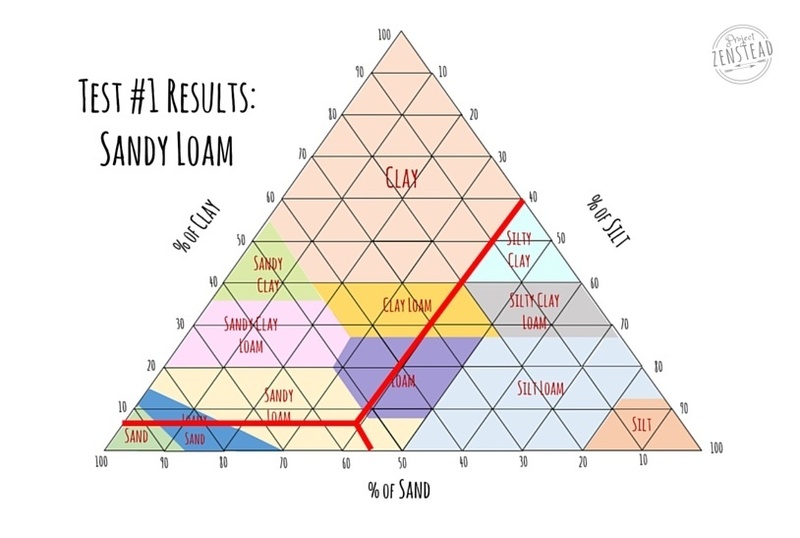 Remember, the combination you want to achieve (called “loam”) is 20% clay, 40% silt and 40% sand. Ideally, your jar will also have a large amount of organic material floating on the top of the water. If your soil has these ideal percentages, buy yourself a beer cause you are rocking your garden! But if you are like the rest of us, put the beer down and check out the handy-dandy chart below to see where your soil fits. 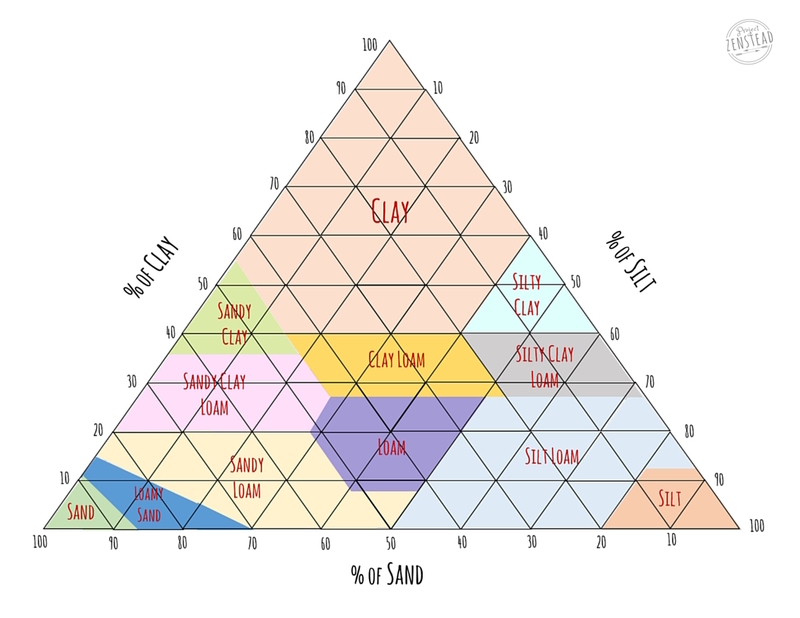 You can also download and print the soil texture pyramid by clicking here: Soil Texture Test Pyramid. By the way, please download it and use it lots because it was a” you-know-what” to create! 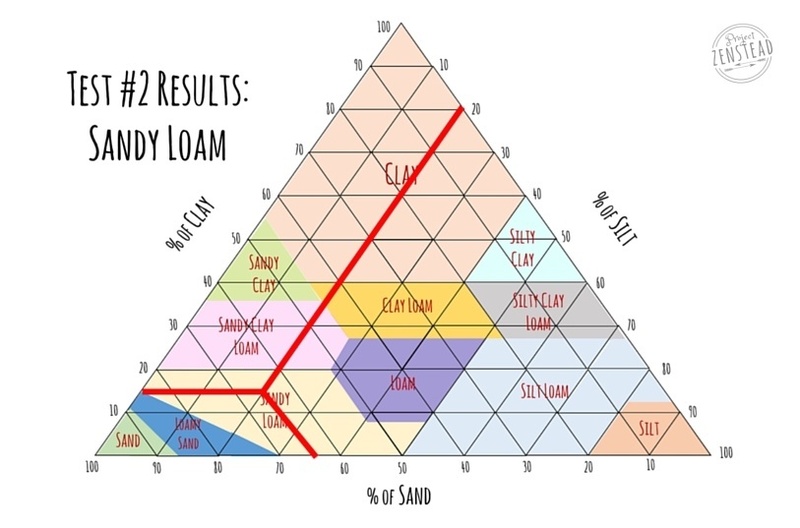 To find your soil type on the soil texture pyramid, draw a straight line from each of your soil percentage results until you find where they meet in the middle…. Kind of like playing battleship but cooler. 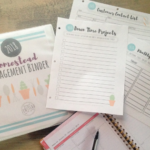 I recently performed this test in three different areas where we plan to garden this year. We moved to this property in the middle of last summer, so it will be our first full planting and growing season at this location. Our soil is super sandy and we have a lot of soil work that needs to be done around here. Despite all the sand, the soil texture tests actually turned out better than I thought they would. This soil is from the new raised container garden that we created in the wasted space between our fence and driveway. It’s a shady area that will be great for lettuces, peas, beans and other plants that prefer some shade. The soil that fills the raised garden bed is extra soil that we are moving off our massive hillside as we attempt to terrace that beast. The last sample is from the area that the previous owner had used as the garden area. Sadly, the soil was not well-developed before planting and it showed. 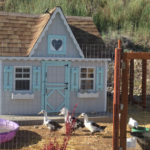 This area is now being used as the pen for our ducks and chickens and will be planted as a free-range chicken and duck garden. And just for fun, I also tested potting soil straight from the bag. The results are pretty cool. You can see the super high organic material content and just a little bit of sandy soil that filtered to the bottom. This mix allows for maximum root penetration and water conduction for seedlings whose roots aren’t strong enough to easily break through soil that is compacted and has drainage issues. Now that you know a little more about your soil texture, it will be much easier to amend your soil and to be aware of soil drainage and water needs. The best way to amend your soil, regardless of soil type, is by adding more organic material to it. Load up on the compost! 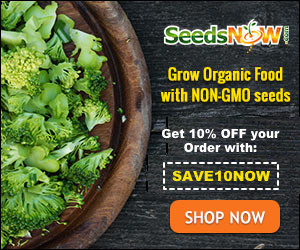 It brings microorganisms to your soil, promotes growth of mycorrhizal fungi (which will help bring vital nutrients to your plant roots), improves drainage, and produces tons of nutrients. Your soil will thank you by giving you tons of healthy gorgeous food to eat. Thank you! After gardening for many, many years, I now know how to test my soil! A great and easy way to do it.